Giant stone staircases outside a small mountain village. 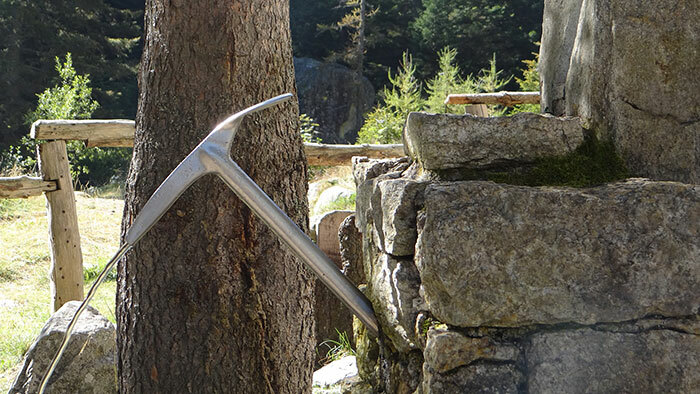 An ice axe buried in rock and spouting drinking water like a font? You could be forgiven for thinking you were in a fairy tale if you saw such things! But if you visit the Valle Anzasca in northern Piemonte, you would come across such things and much more. Steeped in the culture of the ‘Walsers’, these people who spoke with a Germanic tongue, came across the Alps from what is now Switzerland, between 990 and 1200 AD and settled in many of the upper valleys on the southern slopes of the main spine of the Alps. Here the climate was more forgiving. They bought with them their culture, which is why as you drive up these valleys from the Piemontese plains, the style of houses changes from stone walls and terracotta tiles to timber and brightly painted red shutters. The language changes to a cross between Italian/German dialect. But you will still be made welcome and besides looking at the history and culture, there are still the marvelous views. oh and the local honey, ‘Miele Ossolano di Millefiori’, tastes fantastic!